Parents mourn their lost babes of every age. Whether children died in utero or during infancy, whether they perished as toddlers or tweens or teens, or whether death took them by surprise accident in young adulthood or inch-at-a-time illness in middle age, they died out of order. As humans, we’re wired to expect that children won’t die before parents, so when it happens, it’s unthinkably cruel, indescribably painful. If you’ve wondered how to console friends who’ve lost a son or daughter, bless you. Too often, bereaved parents lament over deepened, inflicted pain from ill-thought comments. Or, when grieving parents most need support, they feel the added ache of uncomfortable, abandoned absence from those who avoid them. You can’t fix grieving parents’ pain, but you can avoid worsening it. Don’t tell bereaved parents “I know what you’re going through” or “I understand.” You don’t. Losing your loved one may have introduced you to the pain of grief — and it’s good for you to remember that pain to help you attempt to empathize — but your loss didn’t teach you the intimate rending of self that happened to your grieving friends when their child died. Stop saying “at least” in any context. There’s nothing “least” about the loss of a child. “At least” minimizes the significance of the loss, which grieving friends need validated and acknowledged, not diminished. This includes not saying “at least your child lived x long …” or “at least your child won’t have to …” or “at least you have faith in the hereafter …” or “at least” anything. Never suggest how “lucky” the parents are they won’t have to endure the hard parts of parenting their deceased child. They would gladly endure sleepless nights, endless diapering, terrible twos tantrums, teen angst, college costs, and every other parenting so-called hardship with their beloved child. Never speak of replacing the deceased son or daughter. Loved ones aren’t replaceable. Avoid telling mourning parents they “should” anything. Their loss requires their timing and readiness and processing and coping and surviving. Only they will know when they are capable of accomplishing more than breathing — which will be hard enough for months. It’s impossible to answer. Grief hurts too much. It’s in every cell. It overwhelms and overrides. “Hello” works as a greeting. “How’re you doing?” does not. Telling bereaved parents they have to be strong (for each other, for other children, etc.) only reinforces how weakened and fractured they feel. Let them know you and others are there to pick up the pieces they can’t lift. Acknowledge that mourning hurts without claiming you know how your friends feel. Acknowledging grief’s powerful, painful paralysis validates your friends’ pain. Instead of saying, “Let me know if I can help with anything,” be precise. Fill in the blank with specific tasks or services you can render for your friend. However, please DO NOT TOUCH anything belonging to the deceased child without explicit permission to do so. Parents (and siblings) might need to see the bed left a mess or smell their child’s scent on a dirty shirt or keep a tower of blocks in chaotic disarray where they last fell. Follow through on the activities you offered to do in the list above. Listen to your bereaved friends — parents, grandparents, siblings, and other kin to the child who died. All are hurting. All need the safety of being able to vent without being judged or disciplined for expressing their emotions. A month before, a week before, and the day of, let your friends know you’re aware of their child’s upcoming birthday. During the first year (and beyond), be aware that most bereaved parents dread the death date’s day of the month every month as it ticks off another milestone of their child’s absence. Let your friends know you are thinking of, praying for, and hurting for them — and remembering their absent child — around these dates, especially near the sixth-month and annual death dates. The death anniversary will be difficult. Reach out. Feelings will also be tender near the start and end of the school year when your friends will continue to be aware of what grade level their child would have entered or graduated from. Reach out in acknowledging support. Repeat every year — unless your friends ask you not to bring it up anymore. Respect their wishes while continuing to reach out in nonspecific, loving support. Cut mourning parents some slack if they ignore phone calls, bail on social engagements, or don’t seem like themselves. They aren’t themselves anymore. Part of their self-identity (as Son‘s Mom or Daughter‘s Dad) was shattered. They are still parents to their deceased child — and always will be — but will never again have the opportunity to physically parent that beloved child. That’s not something anyone “gets over.” Ever. If you have children the same age as your friends’ deceased child, be aware that bereaved parents might seek more interaction with you and your family — or less. Continue reaching out either way. *Please forgive me, my dear friends who’ve mourned children, if I’ve tread on tender feelings or gotten this wrong. You’ve taught me more about endurance and living with loss than I’ve learned on my own, and my intention is to honor the grief you’ve borne for the children you’ve lost and continue to love. **The title of my friend Melissa Dalton-Bradford’s book, On Loss and Living Onward: Collected Voices for the Grieving and Those Who Would Mourn with Them, came to mind as I wrote of living “onward again.” I’d planned to type “move forward,” but her better word landed at my fingertips instead. Loved ones can’t be replaced. So please don’t suggest otherwise. 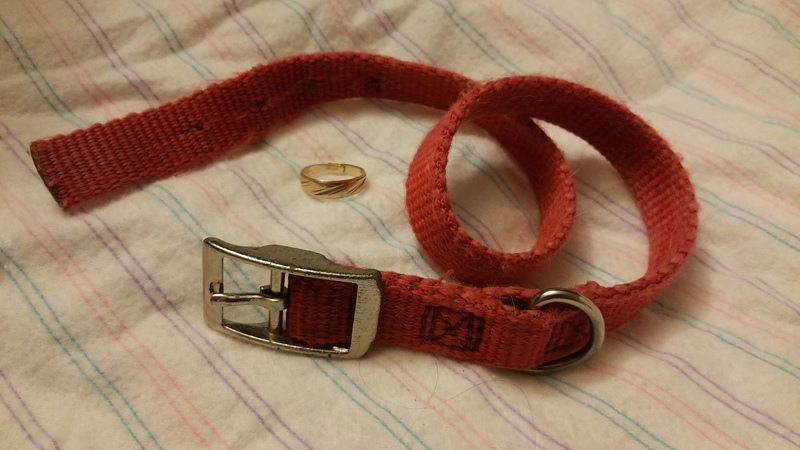 An empty blanket, an empty collar, and an empty ring: Loved ones can’t be replaced, so don’t suggest otherwise. Forgive me, please, if it sounds as if I’m making light of the seriousness of death. My intent is to point out the ridiculous assumptions made by well-meaning people who treat the bereaved in this foolish way. For example, the first variation I heard on “You’re young. You can marry again” was less than 48 hours after my husband’s death. It was an (arguably misguided) attempt to assure me I need not feel lifelong devastation and solitude. But deep as I was in that personal place of raw, recent loss, life as I knew it had already immersed me in devastation and loneliness. I could no more have “replaced” my late husband while thus submerged (nor contemplated the idea of it) than I could have inhaled deeply from the bottom of a full swimming pool. For those who mourn the death of a child, there’s nothing assuring in the agony-increasing comments of those who try to “comfort” them by promises of possible future children. Doing so ignores the life-altering, soul-searing loss of THAT precious, beloved child. Pet owners face their own grief at the passing of beloved companions. Well-meaning friends might suggest it’s “only a pet” or “you can always get another one,” but the bonds between pet owners and their furry (or feathered or scaly) friends are as unique — and can run as deep as — friendships (and deeper than some kinships) between members of the same species. He was such a ____ [kind, thoughtful, funny, interesting…] soul. I’ll miss him, too. I’m so sorry about the death of your ____ [child, parent, friend, sibling…]. I know you’re hurting. Fluffy was a good ____ [cat, dog, hamster, sugar glider…]. She’ll be missed. In time, grieving parents might have another child; bereaved animal lovers might adopt other pets; mourning widows (or widowers) might date and perhaps even marry again. But they might not. There may be reasons they cannot, reasons that are no one’s business but their own. In the distant future, even if the mourning parent welcomes another child, even if the grieving owner takes in another pet, even if the bereaved widow(er) finds a second soul mate, each newly loved one finds his or her OWN place within the healing heart once broken by the death of the deceased. Remember: Beloved souls aren’t interchangeable — even within species. You can’t remove one from a person’s life and simply plop another into the deceased one’s place.